Take a paddle on the wild side and navigate your way through Tully River - Australia’s premier white water rafting rapids. Brace yourself for five hours of exhilarating fun as well as a scrumptious BBQ lunch and return transfers from Cairns. 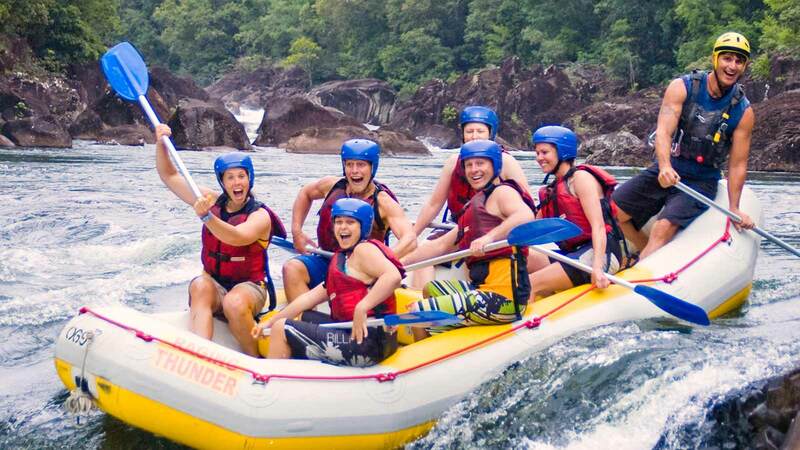 Prepare yourself for an adrenalin filled and adventure packed day on the Tully River. Fringed by one of the oldest rainforest in the world, you’ll experience the beauty of Cairns while getting the ultimate white water rush. Picked up from your Cairns accommodation, simply throw on your swimmers and get set to race down over 40 rapids - which are guaranteed to satisfy your thirst for adrenalin. Then take a break and enjoy a delicious BBQ lunch before rafting on the lower gorge. And before you departure, finish the day at the Tully hub and grab a cool drink while you admire your action shots. Photos and souvenirs are available on the day at an extra cost. Tour departs your Cairns accommodation at 6.30am and will bring you back at approx. 6pm. 2019 Greyhound Australia Pty Limited ABN 59 104 326 383. All rights reserved.